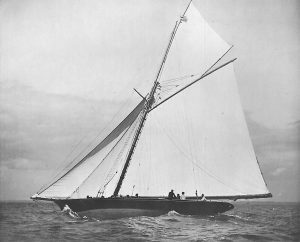 The first important vessel built to suit this rule was the celebrated America Cup challenger Thistle, built for a Clyde syndicate headed by Mr. J. Bell, from Mr. G. L. Watson’s designs. She was a very handsome vessel, with considerably more beam than the older yachts and a large sail-spread. Her rating was 139, whilst that of Irex was 106, and that of Genesta 104. She sailed in a consider­able number of races at the opening of the season, and proved much faster than the older vessels, though her windward work was not beyond criticism. The Royal Thames Yacht Club presented a handsome prize for a race round Great Britain and Ireland, to commemorate the Jubilee of Queen Victoria’s reign. Genesta, Sleuthhound, Gwendolin, Selene, and Aline started, and Genesta won with considerable ease, Sleuth­hound taking second prize, sailing a distance of 1,590 knots, the race lasting over fourteen days. Irex headed the large class of racers in Thistle’s absence, but Genesta was very nearly her match. Vol-au-Vent, Wendur, Erycina, and Vanduara also raced in the large class, and Neptune frequently joined them, sailing in quite remarkable form. The 40-rating class was composed of Foxhound, Sybil, Wraith, Foxglove, and Coryphee, their success being in the order given. Marguerite, Queen Mab, and Melissa had close racing in the 20-rating class, and were fairly evenly matched. A new 10-rater, designed by Mr. G. L. Watson for Mr. G. B. Thompson, named Jess, proved no match for the ex 5-tonner Doris. The only antagonist that ever gave Doris real trouble was Mischief, a beamy Lough Erne boat with a lead keel fixed in place of a centre-plate. She was raced at Kingstown by Lieutenant Tipping, and beat Doris twice. The matches for the America Cup, for which Thistle was built, proved very disappointing. High hopes were built upon the new vessel, and, with John Barr in charge, much was expected. Mr. E. Burgess was again called on to design a defender, and the new vessel was named Volunteer. She was not nearly so handsome a vessel as Thistle, but she was more beamy and of less displacement. The defenders were gradually departing from the traditional American centre-board type and becoming keel boats with a centre-plate added. Volunteer won the first match by 19 minutes 23 seconds, and so amazed were Thistle‘s crew, that they swept the vessel from stem to stern with a rope to ascertain if anything were wrong. The second race, however, removed all doubts, for in a good breeze Volunteer showed a most pronounced superiority, winning by 12 minutes. Petronilla, Yawl, 85 tons. Mr. R. L. Hogg. Maid Marion, ex-Yarana, 60-rater. Designed by Mr. G. L. Watson in 1888. Owned by Mr. Wm. Rice. Though the season of 1888 was lacking in that excitement which the Thistle-Volunteer matches had produced, it was neverthe­less full of interest to yachtsmen. During the winter, as the excitement over the America Cup races gradually subsided, there were several rumours in the air of prospective challenges. None of these, however, took solid shape, but the ranks of the big-class owners received a recruit in the Earl of Dunraven, who was destined to play a very important part in international racing in the future. Lord Dunraven commissioned Richardson to design him a 6o-rater, and Petronilla was built from that designer’s drawings at Fay’s, of Southampton. 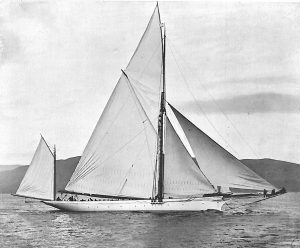 She was a smart craft, but it was her misfortune to have as a competitor a much smarter vessel in Yarana, a Watson-designed ‘sixty,’ built on the Clyde for Mr. P. Ralli. These two and Irex formed the principal racing class of the season. Mr. Jameson’s old cutter was still to be reckoned with in hard breezes and when there was plenty of reaching, but Yarana was well-nigh invincible in light airs. Irex won the Queen’s Cup sailed for at the regatta of the Royal Clyde Yacht Club, and also secured the Albert Cup at Southsea, and finished the season with a record of sixteen prizes, value £910. Yarana’s record was a very fine one. She started thirty-nine times, and took altogether thirty prizes with a value of £1,490. Petronilla won the Dover-Boulogne race, and finished the season with a total of £365 prize-money to her credit. The ‘forty’ class comprised Mohawk (Major Bagot), May (Mr. T. B. C. West), Neptune (Mr. Birchall), and Foxhound (Mr. C. G. Nottage). Neptune always showed to best advantage in a hard blow, but May and Mohawk were both far ahead of her in the number of prizes won at the end of the season. These two sailed very evenly during the whole year, and at the end their respective records were: May, sixteen prizes, value £523; and Mohawk, thirteen prizes, value £345. Vreda, 20-rater. Mr. A.G. Peuchen, Toronto. Designed by Mr. G. L. Watson in 1888. Vreda was another new craft. 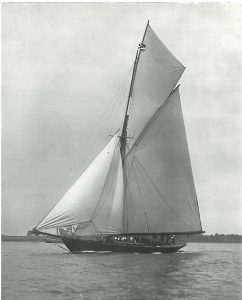 She was built from Watson’s designs for the ‘twenty’’ class, and was owned by Mr. T. H. Hodgens. Her chief opponent was Mr. McGildowney’s Melissa, which, however, had to lower her colours several times to the new boat. Vreda was of very deep draught for her rating. Her record at the end of the season was twenty prizes, value £317, while Melissa scored ten, value £105. Dis was a very smart 10-rater, built at Fay’s, Southampton, and she made a very good record, chiefly, however, in the Solent. Doris, the four-year-old 10-rater owned by Messrs. R. and B. Allan, held the pride of place in that class at the end of the year, with nineteen prizes. Thalassa. Designed in 1887 by Mr. A. E. Payne for Colonel Bucknill. 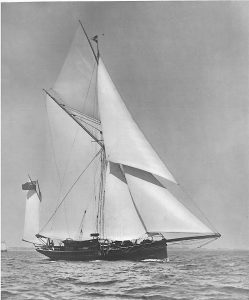 Cetonia (schooner). 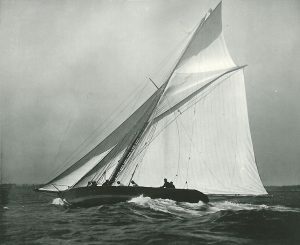 Moina, owned by Captain Bainbridge, won the Queen’s Cup at the Royal Squadron Regatta for the second year in succession. A Queen’s Cup was also com­peted for at the Royal Victoria Club’s Regatta, and was won by Neptune. 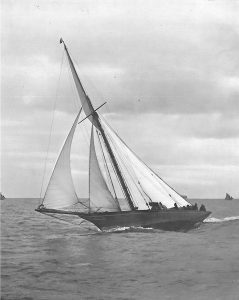 Some interest was taken in a sporting match for £1,000, from Southampton to Madeira, between the ketch Bridesmaid and the cutter Atlantis, in which the ketch, owned by Mr. E. W. Buller, was winner. The small classes on the Solent began to attract more attention, and there was some very good sport in that district. 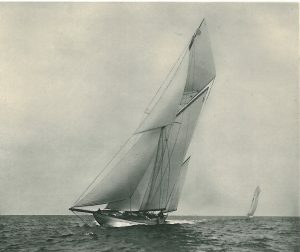 Amongst the most successful boats in the different classes were Mr. St. Julian Arabin’s Lollypop, Verena, Madcap (Miss Cox), Lady Nan (Mr. A. E. Payne), and Thalassa (Colonel Bucknill). Luisa M., ex-Deerhound, 40-rater. Designed by Mr. G. L. Watson in 1889. The year 1889 opened with every promise of an interesting season. The building-yards had been busy during the winter, and there were several vessels in course of construction for the different classes. Interest also began to be manifested in rumours of another challenge for the America Cup. Lord Dunraven had been casting his eyes in that direction, and negotiations had been opened with the New York Yacht Club in reference to the matter. Meanwhile Lord Dunraven had decided upon building another vessel, and this time he entrusted his design to Watson. The Southampton yards were particularly busy during the winter. Side by side in the same building-shed at Fay’s yard Valkyrie and Lethe were being built, both from Watson’s designs, the latter being a powerful fast-cruising yawl for Mr. S. C. Watson, while near by, at Black’s yard (later taken into Messrs. Summers and Payne’s premises), another Watson craft was taking shape. This was the 40-rater Deerhound for Colonel Nottage. Mr. Jameson hoisted his flag again on his cutter Irex, and the principal class was thus composed of Irex, Valkyrie, and Yarana, now in her second season. It was at one time hoped that Lord Dunraven would have been able to challenge for the America Cup with his cutter, but a contest could not be arranged. The fact, however, of Valkyrie having been a possible challenger directed more than ordinary attention to her performances, which were critically watched all through the season. The summer was one of moderate breezes, and those were the conditions that best suited the new boat. Irex was completely outclassed by the modern vessel, and, excepting in hard winds and with plenty of reaching to be done, she had very little chance of wiping off the time allowances which she was called upon to give to her competitors. Valkyrie‘s rating was 77. The new cutter proved as difficult to beat in moderate weather as Yarana was in light breezes, and these two took off nearly all the prizes during the season, although Irex was kept at it pluckily throughout. Yarana came out at the head of the class in regard to the number of prizes won. The respective records were: Yarana, thirty-one prizes; Valkyrie, twenty-six, including the Albert Cup; and Irex, twelve. 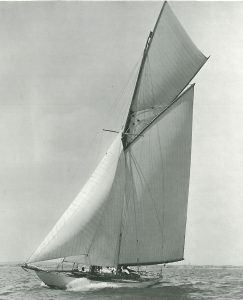 This was the last season in which Irex carried Mr. Jameson‘s flag; she was sold at the end of the year, and was not seen with racing colours aloft again for some few years. Deerhound, which had in her first season established a reputation as a good sea-boat, headed the ‘forty’’ class with twenty-two prizes. Dragon, 20-rater. Designed and built in 1892 by Mr. Wm. Fife Jun., for Mr. F. C. Hill. The big class did not monopolize all the interest during the year. The racing amongst the ‘twenties’ was very keen. Vreda, the previous year’s champion, had three new boats to face. These were: Dragon, built for Mr. F. C. Hill by Fife; Windward, built for Mr. R. Cross; and Mimosa, built for Messrs. Cox and Campbell. The last-named met with but indifferent success, but between the other three, more particularly the Dragon and Vreda, the racing was very keen. Mr.
Windward, Cutter, 20 tons. Mr. John Mitchell. Designed by Mr. W. Fife, Jun., in 1887. Hodgens’s boat made a bold bid for the place which she had held the previous year at the head of the class, but the new vessel was too good for her, and at the end of the season their respective records were: Dragon twenty-three, and Vreda nineteen prizes. 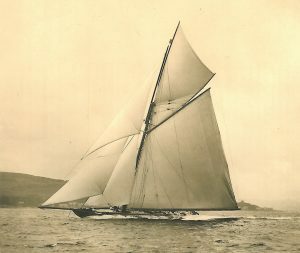 Among Vreda‘s trophies was a Queen’s Cup, won at the Regatta of the Royal Cork Yacht Club. The cruisers were in great force this year, those taking part most regularly being Amphitrite, Foxglove, Wendur, Moina, Vol-au­-Vent, Foxhound, Stranger, Samœna, and Amadine. 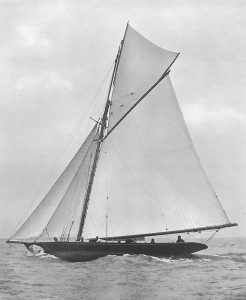 Paradox, a new craft, lug-rigged, belonging to Mr. W. H. Popham, also took part in some of the handicaps. 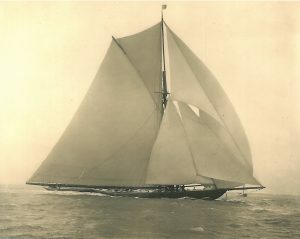 Cetonia, Sir E. Guinness’s schooner, won the Queen’s Cup at the Squadron Regatta. Amphitrite won the cup given by Her Majesty at the regatta of the Royal Ports­mouth Corinthian Club, and also won the Dover-Boulogne race. Decima, 10-Rater. Designed by Mr. Arthur Payne in `889 for Mr. Arabin. Three new vessels were built to the 10-rater class. Two of these, Yvonne and Darthula, were built on the Clyde, and did the greater part of their racing in that district. The third was Decima, built at Southampton for Mr. St. Julian Arabin, who formerly owned the Lollypop. 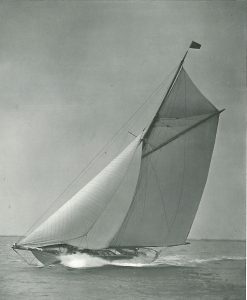 Decima was phenomenally successful in the Solent, and had a string of thirty-four prize flags at the end of the season. Yvonne made a visit south towards the end of the summer. She and Decima were very equally matched. Her record for the season was twenty-five prizes. Wendur, Yawl. Owned by the late Mr. John Clark. There was considerable activity in the smaller classes in the Solent, and several new boats were built. Lollypop came out champion of the 5-raters. Her most dangerous opponent during the season was Fair Geraldine. 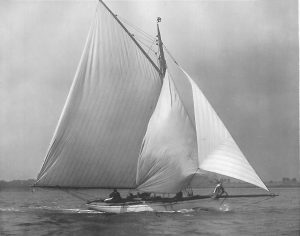 Humming-bird, a Payne boat owned by Captain Hughes, was at the top of the 2½-rater class with twenty-six prizes. Another contest for the Cape May Cup took place during the year. Mr. T. B. C. West challenged the holder with his yawl Wendur, and won the trophy which had been held since 1886 by Irex. Creole, 40-Rater. Lieut.-Colonel Villiers Baget. Designed by Mr. G. L. Watson in 1890.
not going to have things her own way for ever. A memorable match was sailed by the pair in the Solent at the Royal Southampton Club’s Regatta. Seconds only divided them for the greater part of the day, and Iverna led her opponent home. This proved to be but the beginning of a long series of victories on the part of Mr. Jameson’s boat, which continued to the finish of the season. At the end of the year her record was a little behind that of Thistle, the old cup challenger scoring twenty-two prizes, including a Queen’s Cup at the Royal Northern Regatta, while the new boat had twenty. Iverna discarded her centre-board during the season, and the majority of her victories were secured after she had dispensed with it. Yarana‘s record was seventeen prizes, and Valkyrie‘s eleven. Euphrone, ex-Castanet. Designed by Mr. J. M. Soper in 1890. Owner, Mr. H. F. B. Lynch. Deerhound once more came out at the top of the ‘forty’ class, and this notwithstanding the fact that she had two new vessels to sail against. These were Creole and Castanet; the former, a Watson boat, built for Colonel Bagot, whose flag she has flown ever since; and the latter a Soper production. Honours were fairly evenly divided between the two new craft at the end of the season. Creole flew fifteen flags, and Castanet thirteen, while Deerhound had nineteen prizes to her credit. Deerhound‘s prizes included a Queen’s Cup won at the Royal Albert Regatta. Velzie, Cutter, 25 tons. Professor D. W. Finlay, M. D. Designed by Mr. G. L. Watson in 1890. The ‘twenties’ again made an interesting class, there being no less than four new ones out this year. These were Chiquita, Siola, Velzie, and Ghost. 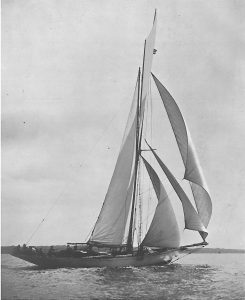 Siola was a Payne design, built for Captain the Hon. Victor Montagu. Neither she nor Ghost were particularly successful; but the remaining pair, with Dragon, provided some excellent sport. Dragon, notwithstanding the new boats, once more came out at the top of the class with the very respectable score of thirty prizes, while Velzie and Chiquita were equal with twenty-six prizes each. There was a fine fleet of cruisers in commission, and they had plenty of sport provided for them. Vanduara at the end of the season flew a string of eighteen prize flags, and, both in regard to the number of prizes and the value, was at the top of the cruisers. Lethe and Wendur each had eleven prizes as their shares of the season’s spoil. Amphitrite, Samœna, May, Neptune, and Foxglove turned out for the handicap matches during the season, and the Queen’s Cup at the Squadron Regatta was won by Mr. Langrishe’s cutter Samœna. Glycera, 5-Rater. Designed by Mr. A. E. Payne in 1890 for Mr. Perceval. Archee, 5-Rater. Designed by Mr. G. L. Watson in 1892 for Mr. J. McNab. Yvonne‘s string of prize flags numbered sixteen, and Phantom was next on the list with twelve prizes. In the Solent more attention had been devoted to the smaller classes, which were beginning to develop considerably. Several new 5-raters had been built, and these included Glycera, Archee, Quinque, designed by Colonel Bucknill, and Valentine, built for Mrs. Schenley. Quinque, 5-Rater. Designed and raced by Colonel Bucknill. Babe. Mr. W. A. Beauclerk. the 2½-rater class, Humming-bird, the previous year’s champion, had to be content with second place, The Babe, a new boat, being at the top. Mliss, owned by Miss Cox, was another new boat in the class. This season could not be described as brilliant. There was a decided falling off in the interest in the big class, due in a very great measure to the fact that Iverna was not to have as her regular opponent the Thistle. 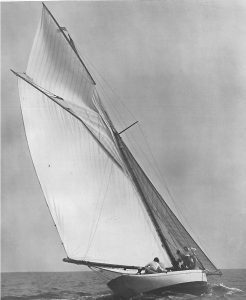 In addition to this, the successful Yarana had been sold; and although she had gone under the ownership of an enthusiastic yachtsman, did not race regularly throughout the season. The big class was thus composed of Iverna, Valkyrie, and Maid Marion – the new name under which Yarana was known. Iverna showed much improved form upon that of the previous year, as far as could be judged without the presence of her chief opponent of her first season to draw con­clusions from. The racing among this trio came to a conclusion on the Solent. Iverna secured twenty-two prizes and Valkyrie fifteen, the latter boat’s wins including the Squadron Queen’s Cup. Maid Marion did not sail in as many matches as her two bigger competitors, and her record consequently suffered by comparison with other years. 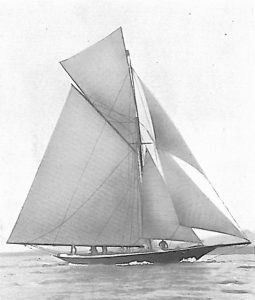 An addition was made to the fleet of cruiser-racers by Columbine, a 60-ton yawl built for Mr. W. B. Paget from Watson’s designs. She cannot be said to have fulfilled expecta­tions, and was regarded as a failure, though she came up with a surprise during the Solent regattas by winning six prizes in one week. Reverie, 40-rater. Designed by Mr. J. M. Soper in 1891 for Mr. A. D. Clarke. Two new craft came out in the ‘forty’’ class – Thalia, a Fife boat built for Mr. J. A. Inglis, and Reverie, built at Southampton for Mr. A. D. Clarke, from Mr. J. M. Soper’s designs. These two, with Creole, formed the principal competitors in the class during the season. Thalia, however, proved so immeasurably superior to her opponents, that she may be said to have practically spoiled the class. She scored twenty-six prizes, while Reverie‘s record was twelve, and Creole‘s only nine. 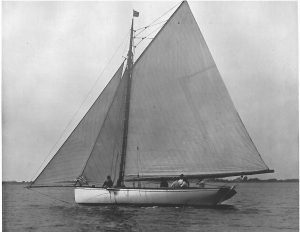 A lug-rigged 40-rater, White Slave, was also built by Messrs. Fife for Mr. F. W. L. Popham, but she was not successful. Once again the ‘twenties’ formed a strong and interesting class. Clarissa came out under Mr. McGildowney’s colours. The class now consisted of six regular competitors: Dragon, Ghost, Velzie, Siola, and Clarissa. Dragon II proved herself almost invincible, and for the third consecutive year came out at the top of the class. Blue Rock, Cutter, 90 tons. Her record of prizes won exactly equalled that of the previous year – thirty. Captain Towers Clarke’s Velzie was next in order of merit with twenty prizes; then came Siola with thirteen, and Clarissa with nine. The cruisers did not muster in such numbers as in some of the preceding years. 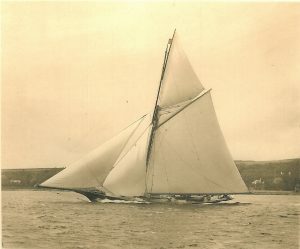 Lord Iveagh’s schooner Cetonia won the Queen’s Cup at the regatta of the Royal Squadron, and Neptune headed the cruisers in the total number of prizes won during the season, with a score of fourteen. Columbine secured twelve, Erycina ten, May eight, Lethe seven, including a Queen’s Cup at the Royal Cinque Ports Regatta, and Blue Rock, a new craft, five. Savourna, 5-Rater. Designed by Mr. Arthur Payne in 1891 for Mr. Perceval. Dora was an addition to the fleet of 10-raters. She was a centre-board boat, and was generally able to show her superiority over the remainder of the fleet, excepting in light breezes, when Yvonne had still to be reckoned with. There was a full season’s racing among the smaller classes on the Solent, with a fair number of new boats out. 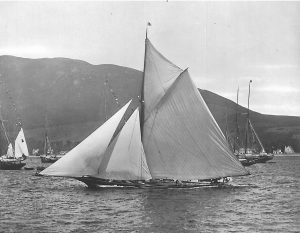 The first and second boats in the 5-raters were Windfall and Savourna, belonging respectively to Mrs. Shenley and Mr. Percival. The former was top of the class with thirty-two prizes. 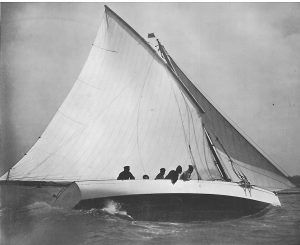 Among the 2½-raters The Babe was champion again with thirty-nine prizes, the second boat, Avadavet, scoring twenty-nine. Other boats in that class were Ornsay, Elfin, and Lizette. Corsair, 40-Rater. Major H. King. Designed by Mr. A. E. Payne in 1892. Queen Mab, 10 tons. Designed by Mr. G. L. Watson in 1883 for Mr. T. B. C. West. The first class this season was composed of Meteor and Iverna only, yet the racing between these two vessels proved excellent. Meteor was sailing in vastly improved form, but Iverna was, on the whole, the more successful of the two. They raced together on twenty-six occasions, Iverna arriving home ahead of Meteor fifteen times. Three new 40-raters were built – viz., Corsair, designed by Mr. A. E. Payne for Admiral the Hon. Victor Montagu; Queen Mab, designed by Mr. G. L. Watson for Mr. T. B. C. West; and Varuna, by the same designer, for Captain Towers Clark. Of these, Queen Mab was a centre-board vessel, and as it was found eventually that she sailed as well without as with the plate, it was discarded. well-designed craft, with a powerful mid­section. Both Queen Mab and Varuna had stems rounded up in the modern fashion, but with moderate overhangs. Thalia, Creole, Castanet, and Reverie also raced in the class. Queen Mab turned out to be the most successful vessel in the fleet, winning thirty-one first and six second prizes in forty-six starts. Corsair, however, showed herself to be a faster vessel in rough water. Natica, 5-Rater. Designed by Mr. G. L. Watson. Mr. H. Trevor Henderson. Wee Winn, ½-Rater. Mr. H. C. Sutton. 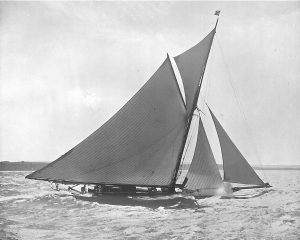 Designed and built by Herreshoff in 1892 for Miss W. Sutton. Bucknill). 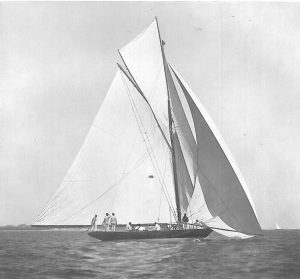 A large fleet of 2½-raters, 1-raters, and ½-raters also mustered, among the latter being Wee Winn, a little bulb-fin boat built by Herreshoff for Miss Cox, which proved exceeding fast. The 10-rating class was confined to the Clyde, and was com­posed of Dora (Messrs. Allen), Phantom (Mr. A. Arthur), Yseult (Mr. Peter Donaldson), and Ptarmigan (Mr. A. Coats). The two first were designed by Mr. G. L. Watson, and the last two by Mr. W. Fife. Of these, Yseult was the fastest, Dora being the next best boat. 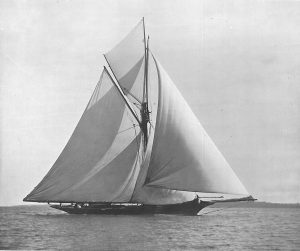 The 2½-raters on the Clyde were very numerous, the best being Wenonah, designed and built for Mr. H. Allen by Herreshoff. She won fifteen first and four second prizes in twenty-one starts. With the season of 1893 we arrive at one of the most exceptional years in the history of yacht-racing, a year made memorable also by the appearance of the Prince of Wales as owner of the wonderful racing cutter Britannia, 151 rating, which during this and several succeeding seasons predominated the sport. 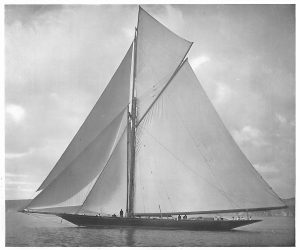 Lord Dunraven, in the autumn of 1892, commissioned Mr. G. L. Watson to design a new cup-challenger, Valkyrie II, of about double the rating of his first cutter of that name. To the intense satisfaction of British yachtsmen, H.R.H. the Prince of Wales shortly afterwards commissioned the same designer to build a vessel of similar size to that already under order for Lord Dunraven. Both these racing cutters were built at the yard of Messrs. D. and W. Henderson and Co. at Partick. At the same time Fay and Co. were building, from designs by Mr. J. M.
Soper, the cutter Satanita, for Mr. A. D. Clarke, and Mr. W. Fife, jun., designed and Messrs. A. and J. Inglis built, the Calluna at very short notice. There was thus every prospect of a very great revival of big-cutter racing, a prospect which materialized in a most satisfactory manner. Lord Dunraven issued a challenge for the new Valkyrie to sail a series of matches for the America Cup, which was accepted by the New York Yacht Club. 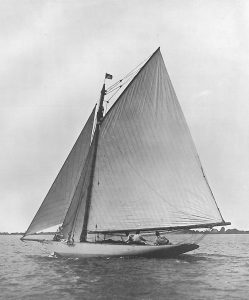 At about the same time Mr. R. P. Carroll, an American yachtsman, announced his intention of challenging for the Royal Victoria Gold Cup and the Cape May and Brenton Reef Cups with the Herreshoff-built cutter, the Navahoe. The racing programme opened, therefore, with the Prince of Wales’s cutter Britannia, Lord Dunraven’s Valkyrie, the Calluna, owned by a Clyde syndicate, and Mr. John Jameson’s Iverna, forming a splendid quartet. These four yachts first met on May 25 for the river match of the Royal Thames Yacht Club. There was a very large assemblage of yachtsmen present to watch the débût of the new boats, and the sailing, which was a fair trial to leeward and windward, ended in favour of the Britannia, after a splendid fight with the Valkyrie. The latter vessel broke her bowsprit in the race, and Calluna took the ground near the Ovens coming home, so Iverna took second place, saving her time on Valkyrie. The racing showed Valkyrie and Britannia very evenly matched, whilst Calluna‘s sailing was disappointing. 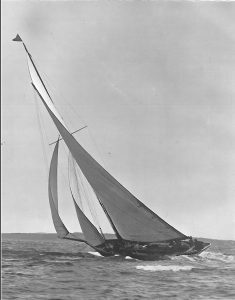 The second match, under the burgee of the Royal London Yacht Club, commenced with a disaster for Calluna, which lost her mast before the start. This left Valkyrie, Britannia, and Iverna in the race, which was magnificently sailed; and though Iverna secured first prize on time, Britannia succeeded in beating Valkyrie by 73 seconds. Following the racing programme, the five big cutters were entered and sailed in the Royal Thames Nore to Dover match. Calluna had been in dock, and was there lightened. It was in this race that Satanita made a remarkable piece of sailing, doing the 14¾ miles from the Tongue Lightship to the North Sandhead in just over the hour. The match ended, however, in favour of the Britannia, with 3 seconds to spare, Valkyrie being second, and Satanita third. In the cross-Channel match from Dover to Boulogne there were eight entries – viz., Britannia, Valkyrie, Calluna, Iverna, Mabel, Lais, Vendetta, and Varuna, but the race itself was marred by a contretemps, in which Valkyrie, Vendetta, and Britannia were involved. A smart north-easterly breeze was blowing, and Vendetta crossed the line first. She came into collision, however, with Valkyrie, and her topmast was carried away in the foul. Britannia came into collision with Valkyrie, her bowsprit fouling the latter’s rigging, and at the same time Vendetta‘s bowsprit was broken off by the Prince of Wales’s yacht. The three cutters were by this time hopelessly entangled, and the Britannia‘s mainsail, pressing against the Vendetta‘s port crosstree, split from boom to gaff. Valkyrie‘s crew worked to cut away Britannia‘s bowsprit, and, the spar breaking, the trio at once cleared. The race was therefore ruined at the outset, and Calluna and Iverna got a clear start of 12 minutes. Calluna beat the Valkyrie by 5 minutes 25 seconds, and the Iverna by 8 minutes 52 seconds. The damages sustained in the cross-Channel race were made good before the fixture of the Royal Southern Club, and Satanita‘s mast had been cut to the extent of 3 feet, and she also had additional lead put on her keel. In this match Valkyrie succeeded in beating the Britannia by 5 minutes 32 seconds, and Satanita by more than 16 minutes. 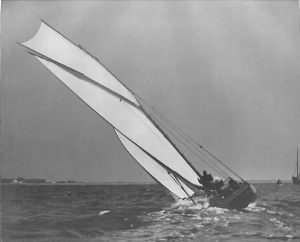 Taking the Royal Mersey Regatta – which, by the way, was the Jubilee – on their way to the Clyde, the big cutters met with boisterous weather, and Valkyrie failed to get her mainsail bent in time for the race. Calluna was another non-starter, owing to her anchor fouling, and Britannia, Satanita, and Iverna alone started, Britannia leading by 2 minutes. The race lay between the two new cutters, and sailing was very fast. At the finish Britannia had 2 minutes 19 seconds to spare over Satanita. The yachts next met on the Clyde at the Royal Northern Regatta, the race opening in a piping breeze and ending in the lightest of airs. 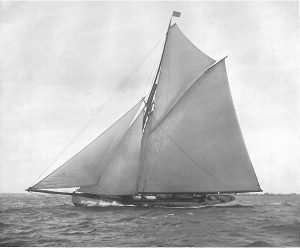 In the latter Britannia had the advantage, and though Satanita led at the start, the Prince of Wales’s yacht beat her by 1 minute 49 seconds. Satanita‘s sailing was showing consider­able improvement, and in the race for the Mudhook Yacht Club prize she was ahead of Valkyrie, though beaten on time. Mr. W. G. Jameson sailed the Satanita, and Mr. George Watson the Valkyrie. In the closely fought duel Satanita‘s gaff caught Valkyrie‘s topmast shrouds, an incident which ended in cross-protests. In the Clyde Corinthian match, in which Britannia, Valkyrie, Satanita, and Iverna started, Valkyrie won by 30 seconds over the Britannia. Britannia was steered by Mr. W. G. Jameson, Satanita by Mr. R. Ure, and Valkyrie by her owner. The Royal Clyde match was singular for its extraordinary weather conditions and a protest by both Calluna and Valkyrie against the Britannia. The race opened in a light breeze, but before Britannia had reached the winning-mark the fleet had experienced the flukiest of winds, a violent thunderstorm, and a downpour of rain. Calluna‘s protest arose through the fact that Britannia, whilst on the port tack, forced her to come about. Valkyrie immediately came into collision with Britannia, the latter boat sustaining some damage aft. In the race Satanita burst her bobstay, and her bowsprit breaking off short, Britannia was left to beat Valkyrie by 41 minutes 40 seconds. The protest was considered by the Sailing Committee, and Britannia was disqualified. The Royal Clyde match was won by the Valkyrie. From the Clyde the racing fleet journeyed to Belfast Lough, where the Irish fixtures opened at Bangor in a north-east breeze – the truest wind that blows over the splendid Royal Ulster course. The contest, in which Satanita beat Britannia by 5 seconds, was one of the finest of the season, the winning boat showing remarkable speed. On the second day, however, the weather was light, and the match lay between the Britannia and the Valkyrie, the Valkyrie creeping to the line a few lengths ahead, and a time difference of 1 minute 56 seconds. For the Royal Irish Queen’s Cup, however, Satanita and Britannia sailed a magnificent race, the former winning the royal trophy by 2 minutes 47 seconds. The sailing of Satanita was very fine, her speed with sheets free being remarkable, Calluna was disabled through breaking her boom in gybing. The American challenger for the Royal Victoria Gold Cup, the Navahoe, arrived in British waters before Cowes Week, and her first match with the splendid fleet of cutters took place under the burgee of the Royal London Yacht Club at Cowes over a course inside the Isle of Wight. The race was a hard-fought one in a fair breeze, Britannia and Valkyrie carrying on a fierce duel, and leading Navahoe home. At the finish, Britannia led by 63 seconds over Valkyrie, and was 83 seconds ahead of Navahoe. The Royal Yacht Squadron programme opened with promise of brilliant racing, and for Her Majesty’s Cup the starters were Britannia, the seven-year-old Meteor, the Valkyrie, the Viking (ex Wendur), and the Mohawk. The fleet started to the eastward in light and fluky airs, with the Emperor’s boat leading. Later, with a more certain breeze, Valkyrie took the lead, closely followed by Britannia. At the finishing-line Valkyrie had gained such a splendid lead that she beat the Meteor by 18 seconds over a time allowance of 14 minutes 32 seconds. She was, however, disqualified, having failed to comply with the sailing instructions, and the cup went to the Meteor. Lord Dunraven’s yacht, though entered, did not compete for the Meteor Challenge Shield presented by the German Emperor, and Britannia and Satanita fought what proved to be an uninteresting duel, Britannia winning after a long day’s sailing and drifting, though she sprung her mast. This precluded all possibility of her racing for the Cowes Town Cup, and Valkyrie, Satanita, Calluna, and Navahoe comprised the list of entries. A hard breeze was blowing, and Navahoe burst her mainsail at the clew, and retired. 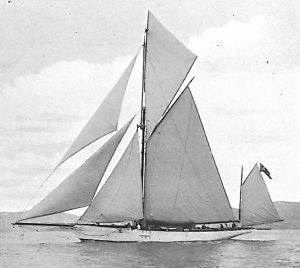 Calluna fouled a steam yacht, which resulted in her gaff being broken and mainsail split. Satanita and Valkyrie were thus left to finish the match. The former vessel displayed astonishing speed in a hard breeze, and finished with 8 minutes 13 seconds to spare. The course of 48 miles was covered in 3 hours 40 minutes 50 seconds. The concluding day’s racing for the Royal Yacht Squadron prize brought together Satanita, Valkyrie, Calluna, and Navahoe, and here again Satanita won a splendidly-fought match in a piping breeze, beating Valkyrie by 4 seconds, with Navahoe 2 1/2 minutes behind Calluna. Of the concluding club matches of the season, Britannia won two at Weymouth. 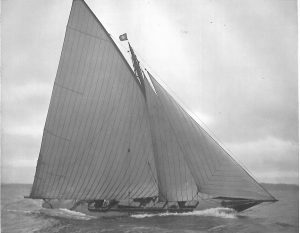 She was not, however, entered for the Royal Dart matches, though she subsequently raced for, and won, the Start Bay Yacht Club prize. Satanita won the Royal Albert Cup, and beat Navahoe in the Royal Dart Yacht Club match. There was by this time little doubt that Britannia was the best all-round vessel of the fleet, with Valkyrie a dangerous second. The Navahoe had shown remarkable qualities on a broad reach or run, but Britannia was superior in going to windward. The results of the matches between Navahoe, the challenger, and Britannia, the defender of the Royal Victoria Gold Cup, the Brenton Reef Cup, and the Cape May Cup, were therefore regarded as foregone con­clusions. Of the Royal Victoria matches little need be written, for Britannia had little difficulty in defending the trophy, beating the challenger by 15 minutes 8 seconds in the deciding race. Britannia, having to allow for her start of 54½ seconds, was declared winner by 2½ seconds. Mr. Carroll protested that the steamer was not in position, and that the difference in, time was less. A committee of the Royal Yacht Squadron considered the protest and awarded the race to Navahoe, a decision which was not universally regarded with satisfaction. The Britannia throughout the season was sailed by Mr. W. G. Jameson and John Carter. She held the record of her class, having gained thirty-three prizes out of forty-three starts, the value of the prizes being £2,500. The Valkyrie‘s record was fifteen prizes out of twenty-four starts, the value being £955. Satanita, in spite of her misfortunes, was winner of a Queen’s Cup and the Albert Cup, and in thirty-six starts she captured thirteen prizes, value £760. Calluna won ten prizes in thirty-six starts. Navahoe, in eighteen starts, won six prizes, including the Brenton Reef Challenge Cup. In the 40-rating division the fleet was not equal to that seen in the previous season, the Queen Mab having been sold to America. The Corsair was replaced by Admiral Montagu’s Vendetta, a fin-bulb and balance rudder yacht with 17 feet beam. 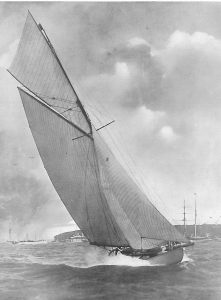 Mr. John Gretton’s new Fife-designed boat, the Lais, was ready early in the season, and the Varuna (Captain Towers Clarke) and Thalia, which passed into the ownership of Judge Boyd, were also raced. The Varuna was victorious in the first four matches of the season, but Lais headed the list with twenty-nine prizes in thirty-nine starts, Varuna being second with twenty-three prizes in forty starts. The Vendetta gained eighteen flags in thirty-three starts, and Thalia six prizes in ten starts. Deirdre, 20-Rater. Designed by G. L. Watson in 1893 for the Earl of Dunraven, and now owned by Messrs. E. Dezilles and A. Cellot. to a list which included Lord Dunraven’s Deirdré and Lord Dudley’s Vigorna. The Dragon was champion of the season, winning thirty-one prizes in thirty-four starts. 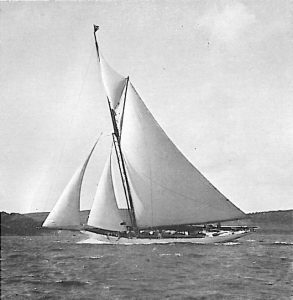 Deirdré had a record of twenty-one prizes in thirty-five starts, and Zinita, designed by Fife for Mr. W. S. Connell, which had things pretty much her own way on the Clyde and did not meet the Southern boats, had a record at the end of the season of eighteen prizes in twenty-four starts. Red Lancer 5-Rater. Designed in 1893 by Mr. W. Fife Jun. for Colonel Sharman-Crawford. place of the 6-raters a class known as the 23-footers was established on the Clyde, and in which Vida, a Watson boat, was champion of a fleet of eight. The Solent 5-rating class was not strengthened with a single new boat, and Red Lancer, which went round the coast, was the champion. The Dacia, Fleur-de-Lis, and Quinque were very evenly matched boats. 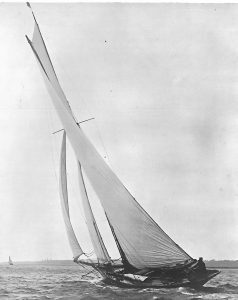 In the 2½-rating class Meneen, by Herre­shoff, headed the list, and the Morwena, also by Herreshoff, was principal winner in the 1-rating class. Of the handicap racers the principal winners were Creole, Castanet, Columbine, Mabel, and Samœna. The season of 1894 opened tamely enough. Britannia had only the old Iverna as antagonist in the river matches on the Thames. 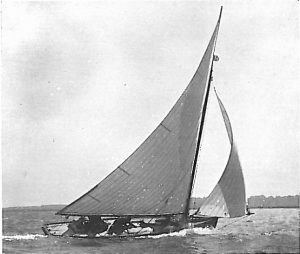 Satanita made her appearance in the ‘down Swin’ match of the New Thames Yacht Club, with more sail than in 1893. Both she and Britannia were over the line too soon, but were allowed to go, and they sailed a ding-dong race to the Swin Middle, with the wind aft. The Watson boat, however, managed to draw away, and won with ease. Satanita and Britannia sailed a stirring race on the first day of the Royal Harwich Regatta. The breeze was hard from north­west, and both had a reef down. Both were obviously over the line too soon, but were not recalled. Britannia led in the run to the Shipwash, but Satanita raced past her after they rounded, and led by nearly a minute at the Sunk Lightship. Then came a close reach (Britannia not fetching) to the Cork and a dead beat in. In this turn to windward Britannia settled up and drew abeam to leeward, and the two great cutters raced level to the committee boat. Just at the finish Satanita drew ahead, and got home first by 3 seconds. Britannia, however, won on her time allowance. Next day, in another gusty breeze, Britannia led Satanita home by 1 minute 54 seconds, but lost the prize on a protest. The Prince’s yacht once more was victor in the Nore to Dover match, sailed this year in light weather. She finished over 4 minutes ahead of Satanita, and in the Royal Cinque Ports Yacht Club race on the following Monday Satanita was obliged to give up with a burst masthead shroud, after she had been well beaten by Britannia in a fresh south-west breeze. Mr. Clarke’s yacht was sent to Southampton for repairs, and Britannia sailed over in the match to Boulogne and back next day. On the first day of this regatta, June 29, Britannia had only Iverna to defeat, but Satanita turned up next day, and had to put up with a light-weather beating. 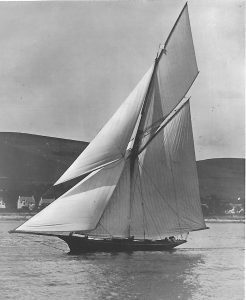 After the Royal Mersey Regatta, Valkyrie joined the first class at the Royal Largs Regatta on the Clyde, on July 3, when she was expected to meet her cup antagonist, Vigilant, which had come to race in Britain under the flag of Messrs. George and Howard Gould. Vigilant, however, did not turn up. Valkyrie had the best of the start, and led until the last round, when Britannia caught her on the wind, and won by nearly 2 minutes. Satanita had to give up. The next meeting of the big boats was signalized alike by the appearance of the Vigilant, the last successful cup-defender, and by a collision between Satanita and Valkyrie, in which the latter was sunk and a man fatally injured, thus preventing the two old rivals from ever meeting again. The yachts were to be steered by amateur helmsmen, and there was a strong wind blowing when Vigilant and Britannia got away. Satanita was standing up the Holy Loch on starboard tack, whilst Valkyrie was coming for the line on port. The anchorage was crowded, and a little boat came across Satanita’s bows. Satanita‘s helmsman tried to bear away, but the little boat did the same, and, to avoid her, the big yacht was luffed and then the helm put up again in the effort to avoid Valkyrie. Unfortunately it was too late, and Satanita crashed into Lord Dunraven’s vessel a little abaft the mast, tearing a great hole in her side. Valkyrie was sent staggering against the steam yacht Hebe, and one of her hands was badly injured in trying to scramble on board the steamer. Clearing the Hebe, she next fell foul of the steam yacht Vanduara, tearing her bulwarks and destroying her steam launch. Valkyrie – Satanita disaster. 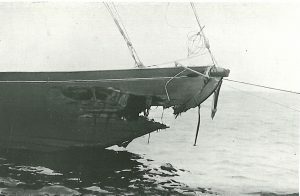 Satanita after the Collision . Valkyrie – Satanita Disaster. 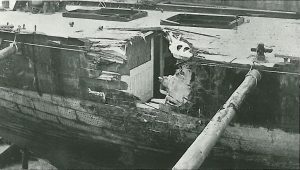 Valkyrie after the Collision. Her own rigging was foul of Vanduara, and her topmast was pulled out; then, clearing again, the fine racer went down head foremost in 14 fathoms of water. Satanita had her bows and bulwarks badly damaged, but sustained no injury below water. During this time Vigilant and Britannia were beating down to Skelmorlie, the American boat persistently weather-bowing the Prince’s yacht. Vigilant led by 1 minute 57 seconds on the first round, and seemed safe to win; but Britannia got a lift on the last round, and won the race by 36 seconds. This not very meritorious victory was the first of a brilliant series of races between these two yachts. The next race was for the Queen’s Cup, which Britannia won on time, her allowance from Vigilant being 3 minutes on a 50-mile course. She held the lead all day until the last run home, when Vigilant got past and led her in by 1 minute 7 seconds. The enormous sail-spread of the American was too much for Britannia down the wind, but on all other points she held Vigilant well. On the second day, which was light and fluky, Britannia won, with nearly 10 minutes to spare beyond her allowance. 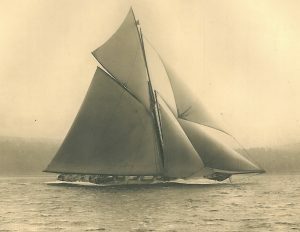 On July 10 Britannia again defeated Vigilant in a light-weather trial at the Clyde Corinthian Regatta, and on the following day she repeated her victory at Rothesay in the Royal Northern match. Vigilant had been lightened of some ballast. The weather was changeable and rather fluky, but the English boat showed better speed when the breeze was steady and true. On July 12, however, the last day of the Clyde Regattas, there was a fine southerly breeze, and Britannia won again with some ease, although she had bad luck in the way of wind. Things were not changed when the two yachts met at the Royal Ulster Regatta on July 16, for here Britannia won again. She had, it must be said, a bit of luck. Next day saw Vigilant‘s first victory in this country, and she won it in a strong true wind and smooth water. She had Britannia well and truly beaten when the latter had to give up owing to her gaff-band bursting. The two yachts next met at Kingstown, and Britannia won again on the first day of the Royal St. George Yacht Club Regatta. This was a plain race, with no turn to windward. The breeze was variable in strength, but not fluky, and Britannia won by 2 minutes. Next day the American won her second victory in very light and fluky weather. Her success, however, was not due to luck, but to light-weather speed. The Penzance and Mounts Bay Regatta was the next meet of the two great rivals. Here Britannia gave the visitor a very pretty beating. This regatta was followed by that of the Royal Cornwall Yacht Club at Falmouth. Vigilant, however, did not start, but Satanita, having been repaired, again met Britannia, and was badly beaten. On August 4 Vigilant and Britannia sailed a private match at Cowes for a 100-guinea cup. Vigilant had been in dock and had her mainsail remade. The weather seemed to suit the American, which sported an enormous jackyard topsail, and she won a very easy victory. A race for a handsome cup presented by the Yachtsman news­paper was sailed round the Isle of Wight on August 6 at the Royal London Yacht Club Regatta. Vigilant, Britannia, and Satanita sailed, and they started to the eastward from Cowes. For a long time it was a very close race, in light and variable weather, and Britannia had a short lead. Both she and Vigilant touched the rocks at the back of the island, and later on Britannia again struck hard, letting Vigilant get a good lead, which she improved, winning somewhat easily. The German Emperor’s Meteor, Britannia, Carina, Mohawk, L’Esperance, and Castanet sailed under a handicap for the Squadron Queen’s Cup on August 7. Carina won on time, being over 33½ minutes astern of Britannia at the finish. On August 9 Vigilant and Britannia met again, racing for the Cowes Town Cup. There was a smart west-north-west breeze blowing, and Britannia won. The next day Iverna, Viking (ex Wendur), and Britannia raced for the Meteor Challenge Shield, held by Britannia, which now won the trophy outright with ease. Satanita was Britannia’s only opponent at Ryde on August 14. There was a fine west-south-west breeze, and in this reaching wind Satanita proved the victor. She had had her sail somewhat reduced since the beginning of the season. Again, on August 16, Satanita put the Ryde Town Cup in her locker, this time beating both Britannia and Vigilant, which, indeed, neglected her in fighting their own battle. The breeze was strong and true, giving a turn to windward and a run. It was a very pretty match between Britannia and Vigilant, but the latter was decisively beaten. The finish was: Satanita, 3 36 39; Britannia, 3 42 23; Vigilant, 3 43 50. On August 17 Britannia and Satanita raced with the 40-raters Carina and Corsair and the cruiser Namara round the Isle of Wight for the Royal Victoria Yacht Club Commodore’s Cup. The result was that Carina snatched the prize on Yacht Racing Association time allowance. A shift of wind accounted largely for this result. Lord Wolverton presented a cup for a race between Britannia and Vigilant outside the Needles – 15 miles to windward and return. Unfortunately, just before the start on August 18 it was discovered that something was wrong with Vigilant‘s centre-plate, and she returned to Southampton. It was subsequently found that the plate had become jammed, the slot in the keel having been squeezed in to 2½ inches from the normal 4 inches. The pivot was broken, and the plate was held in place by jamming with the keel. Satanita scored another win from Britannia at the Royal Albert Regatta on August 20. She saved her time from the Prince’s yacht by 28 seconds. The race was sailed in a strong west wind, and Satanita never gave a better display on all points of sailing. On the following day she again came in first, but failed to give Britannia her time. In the Channel match from Cowes to Weymouth Satanita had bad luck. There was a hard easterly breeze, and soon after the start her spinnaker halliards chafed through, and the sail blew into the water and was torn to shreds. Nevertheless, she led Britannia by about 15 minutes between St. Alban’s and Lulworth, but she had kept a rather southerly course, and Britannia created great surprise by cutting her out with a fresher breeze from the land, winning by 1 minute 11 seconds beyond her allowance. On August 25 Satanita defeated Britannia in the match for a Queen’s Cup presented to the Royal Dorset Yacht Club. It blew very hard, and the course was only 30 miles. The race was chiefly reaching, and Satanita won easily, beating Britannia by 4 minutes 33 seconds. Satanita met Vigilant in the Start Bay Regatta on September in a mere drifting match. Vigilant won easily, Satanita getting completely hung up in the calm, and being unable to finish. Vigilant had challenged for the Cape May Cup, and the match was fixed for September 5. However, in beating up the West Channel two days before the race, the yacht touched the ground in Alum Bay, and the centre-plate subsequently fell out in deep water. The challenge was thereupon withdrawn, though Mr. Gould was willing to sail without the plate and to ship 4 tons of ballast as its equivalent weight. This was the finish of the season. Vigilant had met Britannia seventeen times, and had won five of the events. In all she won six firsts out of nineteen starts. Britannia started in forty-two races, and won twenty-nine first and two second prizes. Satanita‘s record was very close to that of Vigilant – twenty starts and six first prizes. In spite of Britannia‘s fine record, it may be fairly said that Vigilant throughout was sailing under disadvantages, and had some very bad luck. The two yachts were, indeed, very fairly matched, though the British yacht was, perhaps, when all is said, slightly the superior. The 40-rating class was very weak this year, such racing as there was being principally between the new Carina, designed by Mr. G. L. Watson for Admiral Montagu, and Vendetta. The new boat was clearly the better of the two. She sailed in the Kiel regattas, in many of the handicaps, and sometimes with the first-class yachts, winning thirty-two prizes. Asphodel, 20-rater. Designed by Mr. G. L. Watson in 1894 for Prince Henry of Battenberg. Owner, Captain Wm. Stewart. The 20-raters were well represented, there being a strong class as follows: Asphodel, Prince Henry of Battenberg; Dragon, Lord Brassey; Deirdré, the Earl of Lonsdale; Audrey, the Earl of Dunraven; Stephanie, Prince Batthyany-Strattmann; Thelma, Mr. A. B. Walker; Inyoni, the Earl of Dudley; Zinita, Mr. W. S. Connell; and Luna, Mr. F. B. Jameson. Of these, Luna started no less than fifty-three times, winning twenty first, nine second, and three third prizes. Deirdré and Inyoni were also highly successful, and the rest won a fair sprinkling of prizes. Almida, Cutter, 24 tons. Mr. E. D. MacLaughlin. 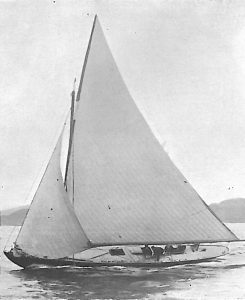 The 10-rating class, confined to the Clyde and Irish Channel, consisted of Dakotah, designed by Herreshoff; Lilith, Almida, and Ptarmigan, designed by W. Fife, jun. ; Dora and Sula, designed by G. L. Watson; and Rosetta, designed by C. Nicholson. Of these, Dakotah was the most successful, winning twenty-five firsts and one second in thirty-three starts. Lilith, Dora, and Almida were also successful boats, Lilith winning eleven firsts and ten seconds in thirty-two starts. 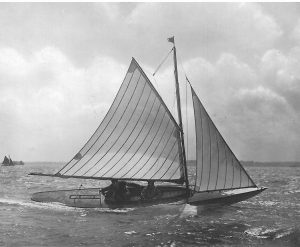 The topic of the winter was another challenge for the America Cup by Lord Dunraven, who commissioned Mr. G. L. Watson to design Valkyrie III for this purpose. The Americans on their side laid down a new yacht, which was named Defender. During the winter Mr. W. Fife, jun., designed the first-class cutter Ailsa for Mr. A. B. Walker, and the 40-rater Isolde for Mr. Peter Donaldson. Caress, another new 40-rater, was designed by Mr. G. L. Watson for Mr. W. H. Walker. 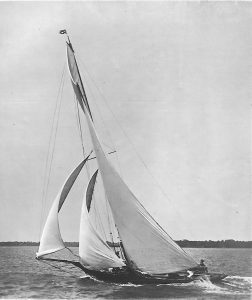 Mr. Howard Gould had the 20-rater Niagara, designed and built for him by Messrs. Herreshoff, and Lord Lonsdale brought out a Fife-designed 20-rater, Eucharis, which was built in a remarkably short space of time. Ailsa was a cutter of 170 rating. She took part with Britannia in the spring regattas on the Riviera, and proved herself to be decidedly the faster vessel at that time. She had a very much larger sail-spread, but showed herself a good boat in breezy weather as well as in light winds. Great expectations were built upon her, but on her return to this country she seemed to have lost all her form. Satanita did not fit out this year. At her first appearance on the Thames Ailsa burst her bobstay and gave up. Britannia defeated her at Harwich in a light wind on the first day of the regatta, and on the second Ailsa got aground after beating Britannia well. Next, at the Royal London river match, she split her mainsail just before the start. She led Britannia home in the Royal Thames match, but lost the race on time, and the same fate awaited her at Dover, where she failed to save her time by 37 seconds. Next she burst her jib at the Royal Southampton Yacht Club match on June 13, when sailing a close race with Britannia, and, though again finishing first, failed by 8 seconds to save her time from Britannia in the Royal Southern Yacht Club race. Ailsa had some lead removed before the Clyde regattas. This had been added on her return from the Mediterranean without making the expected improvement. She also had some reduction of her spars, and her rating was brought down to 160. At the Clyde regattas Valkyrie III, Lord Dunraven’s new Cup challenger, joined the class, the first race being at the regatta of the Royal Northern Yacht Club, on a very, fluky, light-weather day. Ailsa had the worst of the flukes, and Valkyrie, after leading Britannia by 35 minutes at one time, was beaten by her on time. Next day Valkyrie did not start, and Britannia led Ailsa home by 2 minutes 39 seconds in a good breeze. An unpleasant surprise was in store for Lord Dunraven, for at the Mudhook Regatta on July 3, in a fine breeze, Valkyrie was soundly beaten by both Britannia and Ailsa. The race was chiefly reaching, and the new yacht showed up very poorly. This was the fastest race ever sailed on the Clyde. After the Mudhook Regatta a private match was arranged between Valkyrie III and Ailsa. The course was 7½ miles to windward and return, and the breeze light. The challenger led at the weather-mark by 3 minutes 29 seconds, and finished 4 minutes 50 seconds ahead. The three vessels raced again at the Royal Clyde Regatta, when Valkyrie won with ease in light weather, Britannia being second. This was the last race of the Cup chal­lenger in home waters. She had proved herself a fast light-weather vessel, particularly to windward, but she was very tender, and failed very badly in reaching in a breeze. From this time Ailsa and Britannia were alone in their class. Ailsa won a match at the Royal Clyde Regatta, and again at Campbeltown, both days of the Royal Ulster Regatta, and once at Cork, but Britannia won all the rest of their matches in Ireland and the North, including the Queen’s Cup at the Royal Munster Regatta. At Cowes the very pretty 60-rater, Hester, designed and built for Mr. J. Gretton, jun., by Mr. W. Fife, jun., joined conclusions with Britannia in the Royal London Regatta, the larger yacht winning, as might be expected. Britannia sailed over for the Royal Yacht Squadron Queen’s Cup on August 6. The German Emperor’s Meteor (ex Thistle) was entered, and flew her racing flag in the morning, but hauled it down before the start. Ailsa beat Britannia and Hester in the match for the Cowes Town Cup, but next day the Meteor Challenge Shield fell to Britannia. Ailsa, Britannia, Namara, Corsair, Caress, and Isolde competed on August 13 for the Royal Victoria Yacht Club Queen’s Cup, which was also won in a smart breeze by Britannia, on time, Ailsa finishing first by 28 seconds after a magnificent race. In the race for the Commodore’s prize the breeze was so paltry that Britannia had to give up when leading, owing to an engagement of the Prince of Wales, and Carina won on time from Ailsa. The Royal Albert Yacht Club match for the Albert Cup gave another win to Britannia, and a match against Ailsa at the Royal Dorset Regatta, which she also won (on time), brought the first-class season to a close. During the British season Britannia won no less than thirty-two prizes in thirty-nine starts. Most of her races were, however, sailed against a single ship, and, no doubt, had Satanita fitted out the prizes would have been more evenly divided. Of the three 40-raters Isolde, Caress, and Carina, Isolde proved by far the fastest throughout the season. Caress was clearly a good boat, but she was too large in the hull measurements for the rating. Had she been a trifle smaller and been given more sail, she would probably have proved a more successful vessel in the 40-rating class. The new bulb-fin Herreshoff 20-rater Niagara created con­siderable interest this year. She proved to be an exceptionally fast craft, but Lord Dunraven’s Audrey, Lord Dudley’s Inyoni, Mr. F. B. Jameson’s Luna, and Prince Batthyany-Strattmann’s Stephanie, were worthy opponents. The racing was very keen, but Niagara went to the Clyde regattas, whilst the others remained on the Solent. In the North she met Eucharis, Zinita, and the 10-rater Dakotah, winning the majority of her races. The German Emperor’s 20-rater Vineta joined the class at Cowes, and Baron von Zedtwitz raced Isolde, a sister ship of Niagara. The 10-rating class had died out, and the 5-raters on the Solent were Norman, designed and built by Mr. C. Sibbick for Captain J. Orr-Ewing; Pente, designed by her owner, Colonel Bucknill; and Seashell, Captain J. A. Orr-Ewing. Of these, Norman was by far the most successful boat. A very large number of handicap races were sailed, amongst the competitors being Creole, Namara, Rester, Maid Marion, and Vendetta. Lord Dunraven’s attempt to win the America Cup ended very disastrously. The yacht left this country after very little tuning-up, but in the opinion of competent judges she was quite as good a vessel as Defender, being faster to windward, but not reaching so well. In the first match, which was 15 miles to windward and return, both yachts carried jib topsails on the wind. The start was even, Valkyrie getting away first, with Defender on her weather quarter, and Valkyrie at once began to leave the American yacht. Defender, however, was favoured with a shift of wind, which broke Valkyrie off just after she had tacked to cross Defender, and she cleared Valkyrie by a length. After this Defender went away and rounded the weather-mark with a lead of 4 minutes 23 seconds. Running home, she left Valkyrie more, and the finish was (corrected time): Defender, 4 59 55; Valkyrie, 5 8 57. Defender indubitably had the best of the luck. The excursion steamers sadly hampered the British boat in the run home. The second race was sailed in a light wind and smooth water over a triangular course. Valkyrie defeated Defender by 1 minute 16 seconds, or 46 seconds corrected time. Unfortunately, the race was marred by a foul, which slightly interfered with Defender‘s chances. Both were reaching for the line on starboard tack, Valkyrie to windward, and both bore down for the judge’s boat, breaking out jib topsails. Valkyrie bore away to pass close under the steamer, and this brought her very close to Defender. Luffing to keep clear, her boom caught Defender‘s starboard topmast shroud and burst it. The American at once lowered her jib topsail and ran off, not crossing the line for over a minute, and flying a protest flag. The damage was soon put to rights, but Valkyrie kept widening her lead all the way to the weather-mark, being 3 minutes 42 seconds ahead, having gained 2 minutes 50 seconds. On the next leg Defender began to gain a little, and wiped off 11 seconds, and on the last leg home she gained still more, but failed to retrieve her loss. The finish was (corrected time): Valkyrie, 3 55 9; Defender, 3 55 57. 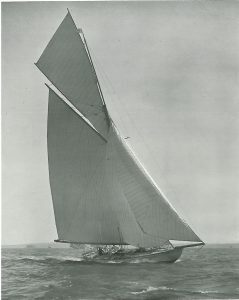 The committee of the New York Yacht Club considered Defender‘s protest, and held Valkyrie to blame for the foul at the start, and awarded the race to Defender. This decision was very much criticised at the time. When the next meeting was held, Valkyrie came down and crossed the line, but immediately gave up. This action on the part of Lord Dunraven was wrongly attributed to pique at what he may have considered an unjust decision. On his return home he issued a pamphlet, in which he stated that changes had been made in Defender‘s ballasting after she was measured. This led to much acrimony, and the New York Yacht Club held an investigation of the charge, at which Lord Dunraven attended. It was held that the charges were unfounded, and the ill-considered step was taken of expunging Lord Dunraven’s name from the list of the club’s honorary members, although the Earl had already tendered his resignation. Thus ended a very painful episode, which created great ill-feeling between the two countries. Mr. C. D. Rose challenged for the America Cup in October of this year, his yacht being Distant Shore, designed by Mr. J. M. Soper. However, he withdrew his challenge shortly afterwards. In this year Mr. J. A. Brand challenged with Spruce for the Seawanhaka Cup, but was defeated by Ethelwynn. Download a pdf of this Chapter or read on … Chapter 10 – Modern Yachting 1896-1900.